Preliminary body work done its time to start preparing to get this thing off the rotisserie. I did a lot of research looking for an undercoating that "A" would last, and "B" was affordable and didn't require specialized spray equipment. I looked at several different bed liners and undercoatings. 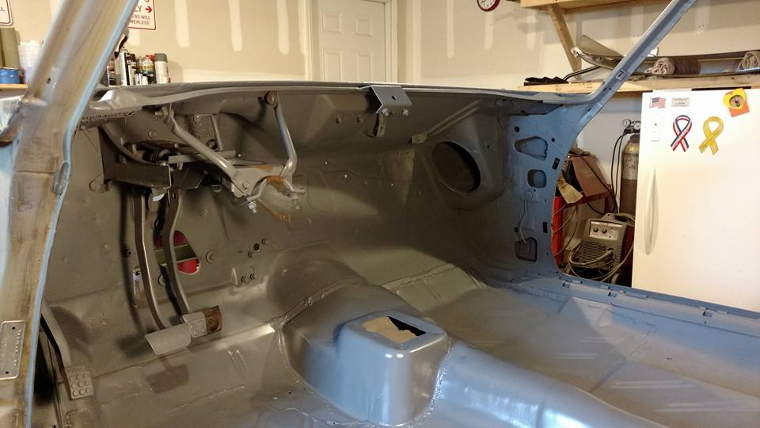 The bed liners are tough but offer no real sound deadening which I wanted so I finally settled on Duplicolor Undercoating with sound deadener in spray cans. Its pretty tough, dries quickly, and can be painted. You'll notice the front frame rails from the transmission crossmember forward are not coated. This is because I wanted the engine compartment to look stock and they would not have been coated (at least not well) from the factory. The frame rails will be coated with POR-15 which is a great anti rust coating. I'll also be using POR-15 on the radiator support and upper control arm mounts simply for the added protection. I was pleased with the way this Duplicolor product sprayed and its coverage. It goes on smooth with a predictable and consistent texture so its nearly impossible to wind up with the typical "stripes" you get when painting large surfaces with spray cans. In total it took 14 cans to cover everything. However, with that said I will still need to purchase a few more cans to do the inside of the front fenders.. but that won't happen for a while. Here is the unibody with the front frame rails and radiator support coated with POR-15. You can easily tell the difference as POR-15 is a gloss coating. With a little different lighting its easy to see the difference. 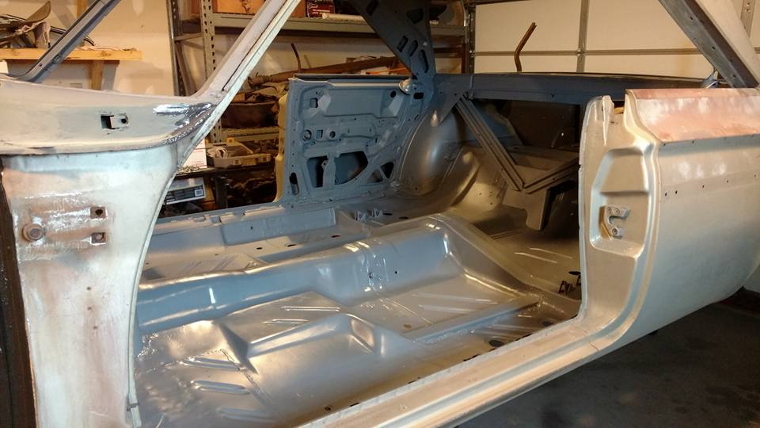 The next job was to sand, clean, and epoxy prime the complete interior of the car. Since I'm on a tight budget I'm using Summit Racing's two part epoxy primer. This is the first time I've used this product and it seems to cover well. I didn't really asses its filling capability as the interior was not "prepped" like you would the exterior. Everything was covered including the under side of the roof and trunk area. This is a protective coating so its important to coat every nook and cranny. Now we can move on to do the preliminary installation of the A/C unit. This is a large (full car size) unit from Vintage Air and has four A/C vents and two defrost. These units are shipped with generic mounting hardware which I felt would not be strong enough. I decided to use galvanized 3/4"x1/16" flat steel stock which is plenty strong enough to keep this unit in place. Making my own brackets allowed me to maneuver the mounting hangers so I could make use existing mounting brackets for the installation. A note of caution here.... if you are welding galvanized metal make sure you grind the galvanizing off before you weld. Welding galvanized metal releases deadly gasses and trust me... you don't need that. Here's a view from the other side. The hose fittings are on the right side so I'll be able to run the A/C lines in through the air vent while the heater lines will come in through the stock locations and run above the AC box and then curve back around and connect to the unit. This way the engine compartment will still look almost completely stock without a bunch of A/C lines running around cluttering things up. My plan is to have the car off the rotisserie by the end of the year.. or sooner. In keeping with that plan the rear suspension components were cleaned and coated with POR-15. The bushings were also replaced. If you have ever tried to remove and replace these front spring bushings you know its nearly impossible without the proper tools. You could beat on them with a sledge for an hour and get nowhere. I happen to have a shop press so it was a fairly easy. If you don't have one you can just take them down to your local garage or machine ship and they can do it for you for a few bucks. Money well spent if you ask me. That's it for this month. Next I'll be reinstalling the fuel system and priming and painting the engine compartment so the engine and front "K" member can be installed. I'll also be cleaning up the differential... which is in excellent shape but it needs to be cleaned and painted anyway.